Recently, the yard has been acquiring some other animals. I don’t want to name any names, but someone has been sneaking in and putting things in my yard. 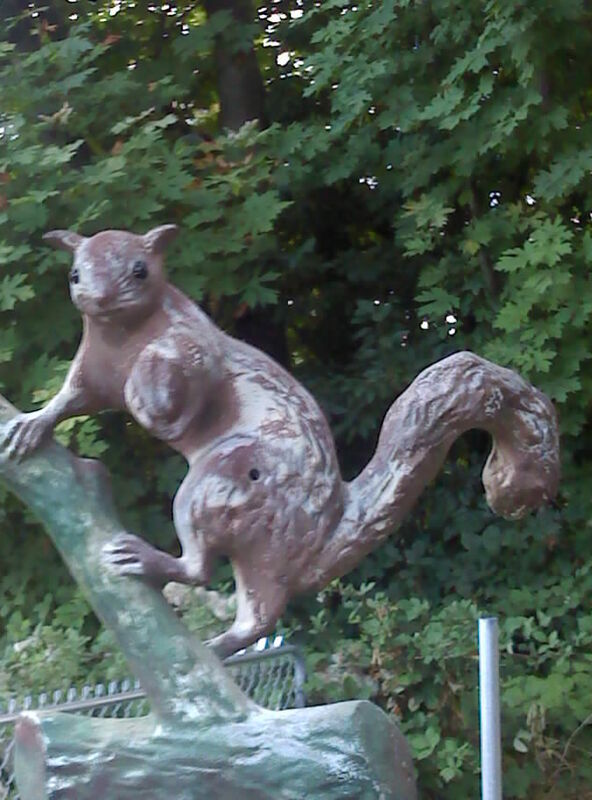 This is Zippy the Zombie Squirrel. He scares me. He’s a yard light, of all things. You get two pictures of him. One in the daytime so that you can see how silly he looks carrying that nut like a football. Honestly. I’ve chased enough squirrels to know that they don’t carry nuts like that. And then there’s a picture of him being scary at night. Can you imagine coming home to this after a nice long walk? I’ve successfully terrorized all the intruders, cats, coyotes, bunnies, rats, mice, and chickens away from the studio, and then I come up the driveway and see this. I tell you. It gives me puppy nightmares. They’re plastic. They don’t run. They don’t do anything. I can’t chase them. They come from children who have destroyed them and left them on the side of the road or at garage sales. Children scare me almost as much as Zippy does. This is a picture of me doing my best to ignore the horses in my yard. It is my yard. Roger’s told me so. He’s even growing grass for me and keeps it mowed and all the leaves blown off of it and now I even have a doggie door that I can use to go in and out… He doesn’t seem to care that these things are in it. Roger calls it art. I’ve decided that I don’t like art in my yard. Bad enough there’s Zippy. Now there’s Flower the Skunk. Yes. Skunk. Gazing in adoration up at Zippy. How much can one dog take? Listen girl- I hear you. Squirrels and rabbits are the bain of my existance. My owner Brian- Roger knows him from Winnipeg, another flakey artist- was out in the back yard with me yesterday- it was a balmy +6.8 C- and you wouldn’t believe the mess. Those rabbits have no social graces. They just do their business wherever they get the urge- no self control WHAT SO EVER I guess that is no surprise considering the size of their families. And those squirrels chatter, chatter, chatter- even though they have nothing of value to say. I wish they would just move those bushy tails on down the street to my neighbour Stella- the collie. She is always running around trying to catch her tail so she wouldn’t even notice they had arrived. May – Did you notice it got worse? He added another plastic animal-type thingie. This time it’s a skunk. I’d take real rabbits any day. I’m jealous. Keep me updated on your ‘hood. Did the squirrels ever go visit Stella?